Chicago Yacht Works started using iCapture just a few months ago at boat shows as a way to increase the efficiency of their lead capture and sales follow up procedures. 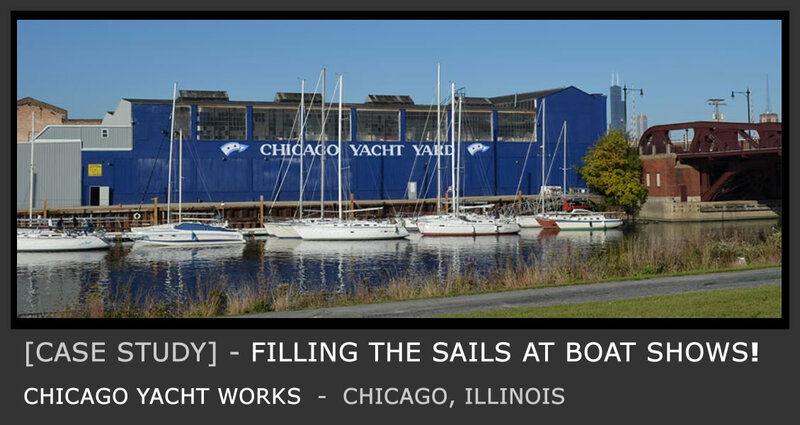 And, according to Nancy Bereckis, Office Manager at Chicago Yacht Works, getting rid of their previous paper-based lead capture system also saved a ton of time because they were no longer having to manually enter data into their Salesforce CRM when they got back from each show. Instead, every lead was automatically added via iCapture’s seamless integration with Salesforce. After seeing the massive efficiencies on the sales side, Nancy and the Chicago Yacht Works team immediately began thinking about other ways they could use iCapture to save on expensive double-handling and unnecessary manual data entry. And so they turned their attention to the 10-point service reviews they carry out on the hundreds of boats they have in storage, which, until now, has been done with pen and paper which has proved to be extremely labour intensive. Instantly add leads captured at your trade show to your Salesforce (or other) CRM. “We were going to be exhibiting some boats at the Chicago Boat Show, which took place in January. And we needed an alternative to just carrying a clipboard and using a paper-based system, because that always takes a lot of time to re-enter into our Salesforce CRM when we get back from the show,” said Chicago Yacht Works Office Manager, Nancy Bereckis. “So we were able to get boat sales this way and also find leads for our Yacht Academy,” concluded Nancy. Meaning you can opt to either have details added to your database immediately (if operating with an internet connection) or you can work offline and simply upload the captured information when you return to your office or other internet connection. And you can also download data to spreadsheets such as Excel. “It was easy to get it up and running. We were able to use our existing equipment – a couple of iPads and a Microsoft Surface Laptop and the customer service people were great. We didn’t have to commit to a full-blown subscription. We were able to do a trial period, which was really helpful. So we were able to trial it very cost effectively and make sure it was what we needed,” said Nancy. The Chicago Yacht Works reported getting an ROI on their initial investment in iCapture at their very first boat show and they were so impressed with the efficiencies of the system, they began looking at how they could use it in other areas of the business. Many businesses are realizing the benefits of mobile data capture for lead generation and sales, particularly at trade shows, exhibitions, conferences and other events. Often that is how a company, like Chicago Yacht Works, will get introduced to technology like iCapture. What is now also becoming more and more appealing for businesses, and a real leverage point for a company like Chicago Yacht Works, is that they can use the iCapture functionality to get efficiencies and provide awesome customer service in other parts of their business for very little, if any additional cost. That’s what Chicago Yacht Works is discovering when it comes to completing the annual mechanical service reviews on the more than 300 boats stored in their facility (Chicago Yacht Yard boasts the largest indoor heated watercraft storage facility in the Midwest). “We do a ten-point inspection on the boats that we store here,” said Nancy. “Because right now I manually enter all that information and manually create spreadsheets for our clients and then manually email that data to our clients, which is incredibly labour intensive,” Nancy added. The 10-point inspections are a vital part of the Chicago Yacht Works revenue base, because the regular reviews generate business. “We use this 10-point inspection to generate business because it helps the customers see what needs doing on their boats. For example, if their batteries are needing replacement, or if the bottom of the boat requires painting, we will note that on the 10-point inspection and then the customer will likely want us to do that work,” said Nancy. And not only is this going to save the office team dozens and dozens of hours of manual data entry, it’s also going to be faster for the mechanics completing the inspections. “And it’s going to be quicker for the mechanics, too, because instead of having to hand write the answers they will be able to simply choose from a range of pre-determined options,” said Nancy. You can trial iCapture today for free (no credit card required). Chicago Yacht Works sits on 10 acres of land on the South Branch of the Chicago River, offering over 600 feet of river frontage. This large, full service nautical facility offers boat storage, service and brokerage, as well as providing classes on how to operate boats via their Yacht Academy.